Center for Research on Environmental Chemicals in Humans was approved by the IRS for 501(c)(3) non-profit status on June 28, 2017. We value transparency because you have an absolute right to know how your donation is being spent. Our profile on Guidestar is complete through their “Bronze” level. We can’t go farther until we file our first tax return. Guidestar has a place for that, but not for other official sources of information. However, we can take the next best step and give you access to the IRS Form 1023 which we filed requesting non-profit status. That detailed filing contains financial estimates of how much we hope to raise and how we anticipate spending it. Stealth Syndromes Human Study — Approved by the University of California, San Francisco Medical School’s Committee on Human Research in 2015, this is the controlled first human study of environmental chemicals. This effort is the #1 priority for CRECH. The Stealth Syndromes Project — This multi-year endeavor began as an effort to clarify environmental risks for a non-scientific audience. After writing scores of articles based upon the study of hundreds of published, peer-reviewed studies, project founders Perdue and Yeamans-Irwin realized that no adequate science existed that could justify valid decisions based on causation. They realized that to move beyond non-causal links and associations based on animal studies and epidemiology, they needed to create the missing science. With the the collaboration of UCSF Professor and Victor Reus, that study was developed and approved by the UCSF/CHR. PharmBlockers — Using existing pharmaceutical evaluation results as a more accurate paradigm for assessing environmental chemical risks — This is a fledgling effort that has resulted from Stealth Syndrome Project research which discovered that some environmental chemicals work in ways that counteract approved pharmaceuticals. More specifically, those environmental chemicals work in direct opposition to the exact same cellular mechanisms targeted by drugs. As one example, published studies indicate that Bisphenol A promotes resistance to cancer chemotherapy, thus making treatment less effective. This is especially significant given that most plastic intravenous tubing leaches BPA and associated environmental chemicals. This example of a “PharmBlocker” suggests that those environmental chemicals need to be evaluated with the same degree of scrutiny as the pharmaceutical whose effects they harm. Stealth Syndrome Study, Part 4: How Do Science & Society Benefit? Stealth Syndrome Study, Part 1: Where Did The Idea Come From? 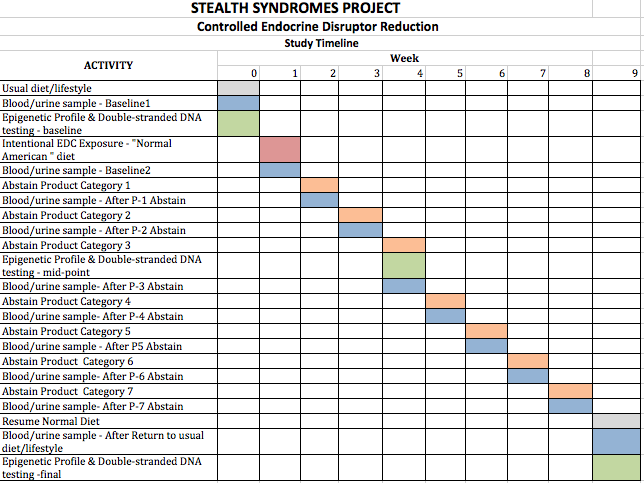 Stealth Syndrome Study, Part 2: How Will The Process Work? Establishment of a framework to move risk assessment of low-level Chemicals of Emerging Concern beyond traditional toxicological evaluations and toward molecular and epigenetic evaluations. But getting to that main question came only after other questions popped up. Why had no causal connection had ever been established between low levels of environmental chemicals and human harm? That question haunted us after three years of analyzing the scientific literature for the Stealth Syndromes Project. Why no causal connection? Because there had never been a human study. What’s the big deal over having a human test with exposing people to the same chemicals that they consume every day? And which the FDA says is safe? We still have no answer to that, and it’s not a testable hypothesis for our study. For more: Why Have Regulators Failed To Regulate? How could we conduct a test on humans that was ethical? The controlled and stepwise elimination of environmental chemicals known as Chemicals of Emerging Concern (CECs) from the test subject environment will result in measurable changes in serum and urine concentrations of specific chemicals and standard clinical health biomarkers attributable to each class of CEC-containing product. Remember that science is rarely as precise as non-scientists have come to expect and frequently falls short of what scientists would like. Our testable hypothesis is that we can establish a causal relationship between removing a CEC/EC from a human’s environment and a change in a blood profile the medical and scientific community trust as an indication of health. Implicit in the hypothesis is that the health indicators will change in ways that indicate an improvement in health. That is not a certainty. This is because the health indicators chosen for the study may not be sensitive enough to produce statistically significant results. That’s an inherent risk in a first-of-a-kind investigation like this one. Even if the study provides support for the hypothesis — this study will not be able to scientifically state that, “CEC/EC exposure causes cancer, obesity, Type II Diabetes, etc. Why Focus on Bisphenol A (BPA) & Phthlates As Markers? This study will focus primarily on BPA as a marker for the presence of CEC/ECs. This is because foods, beverages and other exposure sources contain multiple compounds. That makes the task of identifying which compounds (or synergistic combinations) are responsible for a given health effect impractical for the scope and budget of this study. Indeed, given the lack of data on the health effects of most chemicals involved, the task would be impossible for the budgets and technical abilities of even the most advanced laboratories. Significantly, even less data is known about combined health effects of the everyday mixtures to which consumers are exposed. BPA and phthalates have been chosen as markers because the U.S. Centers for Disease Control has found those persistently present in almost all Americans. As the footnotes in the study & protocol point out, a number of published papers have measured levels of CEC/ECs in foods, beverages and other sources. The present study will focus on dairy products as a category for its own abstain/intervention. This is because a recent study found an unexpected increase in phthalates especially in children. That study theorized this increase was due to their greater consumption of milk than adults. Investigators in that study theorized that the extensive use of plastics in the milk-production process was responsible for the phthalates increase despite the fact that milk was delivered in glass bottles. In fact, that study calculated that children were exposed to 183 micrograms/kg/day and noted that level was more than 9X higher than, the EPA oral reference dose of 20 micrograms/kg/day. The protocol calls for measurements and stepwise reductions over a nine-week period. The first week is a baseline period after which health indicators are measured. The second week, is one in which test participants consume a “typical” diet which will include food and beverages packaged in plastic and heated in the packaging as instructed. The diet will also include foods prepared from cans (tomatoes, vegetables, fruit). In addition they will experience ordinary environmental and contact exposures. Then, for the next seven weeks, one category after another will be eliminated. Let’s take one single meal as an example. Suppose that test subjects eat lasagna every Tuesday evening for dinner for nine weeks. The first week of the study, the lasagna would be made with commonly used supermarket ingredients such as canned tomatoes and mass-produced ground beef wrapped in plastic, and browned in vegetable oil from plastic containers. Of concern is the fact established by multiple peer-reviewed studies that he epoxy linings of more than 70% of food cans leach BPA and other environmental chemicals. The same is true for the plastic used to package ground beef and to bottle vegetable oil. The second week of the study, the recipe is the same, but instead of cans, tomatoes packed in glass jars would be used in the lasagna. Traces of surfactants used in the washing of the jars may exert some biological action, but that is unknown. The third week of the study, the recipe remains the same as week two except that lasagna is made with fresh tomatoes. The fourth week of the study, the recipe remains the same as week three, but the lasagna is made with fresh organic tomatoes. The fifth week of the study, the recipe remains the same as week four except the lasagna is made with fresh organic tomatoes and freshly ground beef that has never been wrapped in plastic. The sixth week of the study, the the recipe remains the same as week five except lasagna is made with fresh organic tomatoes, freshly ground beef that has never been wrapped in plastic and cheeses never exposed to plastic wrapping. In weeks 7-9 the recipe remains the same as week six. These three final weeks involve the elimination of BPA from non-food and beverage exposures with the result that subjects will consume meals identical to those in week 6. In order to assure best compliance among test subjects, all meals will be standardized, prepared in advance, packaged in glass, frozen and microwavable. Snacks and other consumables will be similarly standardized. Test subjects will engage in real-time, daily logging of everything they eat, drink use, or apply to their bodies. Weekly blood profile and urine measurements of Bisphenol A and phthalates for correlation with blood biomarkers. One of the study’s toughest issues is the considerable effort needed to the control for potential confounding factors resulting from the epigenetic activity of methyl-contributing micronutrients (such as folate and genistein among others). Epigenetic means that the activity of a gene is changed without an underlying change (mutation) in a gene. A methyl group is an molecule composed of three hydrogen atoms connected to a carbon atom. 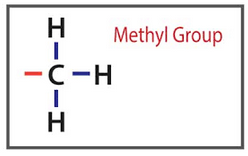 Methyl groups are common in cells and like to form compounds. They can attach themselves to specific locations in the DNA and act in an epigenetic manner to change how the gene expresses itself. Published work (references at the bottom) indicate that methyl-contributing micronutrients have demonstrated the ability to significantly alter the known epigenetic effects of BPA. While those studies have been conducted with murine models, the possibility of parallel human effects unknown and could be of substantial concern. As a result, the possible confounding factors of such micronutrients demand that the study determine reference levels of BPA and that of methyl-contributing micronutrients in the test subject diets on a meal-by-meal basis. Instead of trying to establish pre-preparation levels of potentially confounding compounds in the food recipes, we propose establishing post-preparation concentrations in an exemplar of each meal which can establish reference points to examine what may be confounding results. This would require the maceration of one exemplar of each standardized meal and the measurement of levels of BPA and methyl-contributing micronutrients in the supernatant. This would also continue for food and beverages consumed in weeks 7-9 and thus provide a quality control for resulting measurements. Establishing the concentrations of methyl-contributing micronutrients, and pesticide residues in each meal offers a method to that can be used to control for those confounding factors. In addition, tracking BPA in each meal may also point to previously unknown sources, especially if unexpected concentrations are found in the meals of weeks five through nine. See Why Have Regulators Failed To Regulate? for more on that FDA issue. This prohibition against human research is why rats and mice (known as a murine model) are commonly used. In the absence of human studies, hundreds of recent, peer-reviewed studies have linked low level exposures of Bisphenol A, for example, to cancer, obesity, diabetes as well as reproductive and developmental harm. Correlations — as discovered by the science of epidemiology — have often saved many lives by pointing scientists to look for the causal links for many diseases and syndromes including cholera and AIDS But epidemiology is not definitive.